So, what’s your marriage like? How do you feel about your relationship with your husband? Do you feel as though you’re struggling to even like the guy you married? Do you love your husband deeply, yet long for him to grow into more of the godly man you desire? Do you crave more joy in your marriage, more peace, more contentment? Or are you feeling pretty satisfied with your married life? Are you feeling like your marriage couldn’t possibly get any better? Are you overjoyed with your husband and love every minute you spend with him? Your personal relationship with God needs to be your top priority. If your relationship with God is strong and growing, you will be bringing more joy into your marriage. Why? Because having a dedicated relationship with God will bring your heart peace and joy…making you a better person, a better friend, a better wife, a better help meet . That’s the result of choosing to put God first in your life. Peace. Joy. Contentment. Will you always be happy? Will things always go your way? Nope. Will you be able to change anything about your husband? Maybe. Maybe not. But if your relationship with God is what it should be…you will have joy in your life. You’ll have peace in your life that passes all understanding. You’ll be content knowing that you’re doing just what God wants you to do. Don’t you want that kind of wife for your husband? Doesn’t it give you a little thrill thinking about the kind of wife you can be to your man, just by learning more about God and His desires for you? Let God teach you and transform you into the wife you need to be. Spend time daily (constantly) with God, reading His word, meditating on what He’s trying to tell you, talking to Him about what He needs you to do, listening to Him, praising Him. I know many of us struggle with spending special time with God each day (and we have all kinds of excuses). It takes effort. It takes discipline. It takes desire. Be intentional. Your marriage depends on it. Share with us: What are you doing each day to spend time with God? What are some of the tricks you have discovered for carving out time for God in the midst of your busy days? What works for you as you juggle day to day tasks with building a stronger relationship with God? Please share with us so that we can all learn new ideas! Challenge yourself: Is your relationship with God what it should be? In what ways do you need to grow in your relationship with God? Are you spending time with God each day as you should be? Where is your heart? Are you making God your number one priority? Thank you for this! Very relevant! I try to combine my Bible reading with something I do every day: eating breakfast. Most mornings I eat cold cereal or toast, and I am sure to have my Bible handy so I can meditate on God’s message for me that day. During the baby stage, I have been successful reading Scripture while I nurse the baby. Selecting a time that pairs with something I do routinely every day helps me feel like something is really missing when I neglect this habit. I’m a Bible-breakfast girl too! It works so well for me! Words so fitly spoken! I have found that when I take my eyes off of myself and trust the Lord with my husband, I am a much happier person. 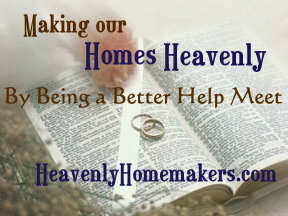 I then pray and ask the Lord to help me love my husband the way HE (God) loves him, which is unconditionally. It is only then can I truly love my husband the way he needs to be loved. Thank you so much for posting this. I forwarded it to my women’s bible study to hopefully challenge and encourage them. My time with God happens at nap time. It’s in the middle of the day, but the house is quiet and it has worked for me for a few years. I know that my time will God will change once all the kids are in school, but for right now it’s working. I rise early every morning (up by 430, this morning it was 415 lol). We have a study in our home, so I go in there and read, and pray, first thing! For me, I don’t want to be squeezing in time while eating, or while the children nap. But I generally spend that first hour w/God. Then I get my exercise and shower in, dressed etc. Then the house is up. I find that when I spend that time w/God my day goes so much better! And in turn I’m a better wife. Last night at bible study the woman who ministered challenged us to go to bed praying in the Spirit, and wake up doing the same. She said it sets the tone for the day as well, could be helpful for those who don’t get to pray or spend time w/God until later in the day. I did it this morning, (I did forget last night.. short term memory lol) and the day is going well! I realize that not everyone believes in praying in tongues/in the spirit, but for those of us who do, give it a try! I’m going to try that. I’m really a night owl and prefer praying after everyone is in bed, which makes getting up early more of a challenge. But I concur, that praying in the Spirit definately affects my sleep and when I awake. Now if I could do both that would be great! Truly makes one appreciate the testimonies of the women in previous generations that “burned the midnight oil.” I think it wasn’t that they must have been amazing women by themselves but because they entrusted so much more to God = more prayer. That produced great things! Oh Laura, jsut last night I was wondering what happened w/this series! Glad to see it again! I’m a new reader and commenter, but I definitely believe there is a direct connection with your relationships with others and your relationship with God, especially your relationship with your husband. I find that my heart easily harbors frustrations and bitterness with my husband if I’m not spending time in prayer and Bible study with God. You are right, we must be intentional. And if we are having a hard time spending time with God we need to examine ourselves and see what is taking up that space, repent and pray for God to give us a deep desire for His word and communion with Him. That is a prayer He will definitely answer! I’m not very successful at consistent purposeful time right now. I appreciate the comments, and will be watching to read more. I have the desire, but not the discipline. Been distracted very easily for quite some time now, and it’s definitely time to change that! Awesome! This year, it’s my goal to be up earlier for prayer and devotion time. I always have more time in my day when I do. I’m blessed w/ a truly good man, that loves God…and is human. ? When my heart is for God, I see how much grace I truly need and it isn’t so difficult to give grace to my husband. I’ve not been consistent for at least a year with regular time in God’s Word, in prayer/praise, etc., (and have felt the negative consequences of this) so I joined a ten week Bible study (just four homeschool families). This particular study requires at least five days/wk studying on my own and we meet together once/wk. The accountability is important for me right now to work at developing better habits again. It is like drinking water (or eating sugar, for that matter); the more you drink/eat, the more you crave. I’m a Bible-breakfast girl too (maybe this is just an excuse to not have to get up early but) that way I can read aloud to my boys who can’t yet read. It helps teach them and saturate them in the Word, and also reinforces what we’ve read in my mind since I’m going through it more thoroughly to explain it. Modeling daily worship to them will help them develop the habit of private worship for themselves when they can read alone. I have a bible I keep in my car and when I am waiting in the line to pick my girls up from school, I read it. I also have a small pocket bible in my purse and instead of reading magzines while waiting in a waiting room, I read it. I love the idea of reading outloud during breakfast. Maybe that would help stop the bickering between them. I have so enjoyed your website! Due to a lot of moving and stress, I was not able to get involved with others’ blogs until now. I just want to say thank you! I have read over the last few weeks and am soaking in so much! This particular post hits HOME big time! I am about to embark on a BIG project. You see I have struggled with getting up early to have time with God….sometimes it works and sometimes it doesn’t. So I try to sneak in a lot of prayers and talking to my kids about Jesus everyday. However I realized I do not know much about Bible stories. So my project is to read the Bible from front to back (within 6 months). This has come about because #1…I have been wanting to just be able to tell the stories of the Bible to my kids without trying to read through the big words for them and I don’t always understand what I am reading the first go around. And #2….we are starting over with eating….we are going back to basics of healthy wholesome eating the way God intended. But I do not know everything the Bible says about food and want to truly know! Do we drink milk or not drink milk? The questions I have need specific answers! :) So I thought I would share this with all of you. I am a “beginner” in my journey with knowing God. I have absolute faith in Jesus, but I want to truly KNOW what God says and the only way to know HIM is to know His Word. Tracy, I’m right there with you on just about everything you said! I’ve been trying to read through the Bible for the last couple years without success due to being in college, getting married, and buying our first home, but this year is it. I want to know God’s word and for when we have kids I want to be able to teach them the basics that right now I hardly know. Keep pressing on, one day at a time with your reading. I’m not quite as ambitious as you, doing it in only 6 months. But I know it’s possible! Although I try to be intentional spending time with God I do find myself distracted throughout my day. I will admit that whenever I am stopped by something (on hold on the phone, at a red light, sitting in traffic) kids around or not, I consider God nudging me to share. I take that time to be thankful to God for what I have and to say prayers for those who need it. I feel like it shifts me into the right direction in the times when I would otherwise get frustrated. And anytime I read for “fun” (magazines, books etc,) I read a chapter or 2 in the bible first…just to get off on the right foot! I have never commented on your blog before, but read you faithfully. This year I have decided to live intentionally in all areas of my life which includes reading my bible first thing every day! It is way to easy for me to get busy and try to come back to it, so I just make it my top priority. One of the things I am always amazed about is that when I open my bible to read a verse, it clearly jumps off of the page and speaks right to my heart about something that I am in need of hearing right then!! It is an amazing gift and is a huge reminder to be gracious with my words and actions that day towards not only my husband but my kids too. No hubby for me, but I believe this time of singleness can be used to learn how to put God first and that will hopefully make it easier for me when/if I am married. Ever since I graduated college and began life in the “real world,” spending time daily with God has been a struggle. It was so easy in college because my time was so flexible. It’s much less flexible now, and I know it will be even less if I ever do get married and have kids. A good friend and I have been discussing ways to improve our quiet times, and she thought of the idea of leaving for work 30 minutes to an hour early, getting to the general area of work, and then spending that extra time in a coffee shop reading God’s Word and journaling before heading to work. I love that idea and am hopefully going to start doing that next week! my time as of late has been first thing. The boys watch some pre-recorded show that I’ve approved (ie. Looney Toons) while I sit and read for a few minutes. I also am doing The Love Dare, so that is fit into that time as well. What a beautiful post, Laura– it blessed me. As a mommy to 3 littles, ages 6 and under, I definitely find it a struggle at times to have my daily “quiet time” with the Lord. As far as my Bible reading goes, I try to read early in the morning before my kids wake up, or else I have my devotions while they are napping in the afternoon. I think the thing that has helped me the most in my daily walk with the Lord, is learning to “walk in the spirit” throughout the day. Training my mind to concentrate on Scripture, the goodness and blessings of God, and just communing with the Lord while I work during the day. This has gone a long way in producing joy and peace in my life as I strive to draw closer to my Savior. The closer my husband and I have grown to God individually, the more intimate and stronger our marriage has been collectively. It has been an amazing thing, a beautiful thing. I just thought we had a good marriage before, now it’s a thing of wonder. I read my Bile for 30 minutes every morning – from 4:30-5:00. I read slowly, studying and referencing and researching as I go. I love this Laura. Thank you for the post. One of the things I do is to do my spiritual reading while I’m at the gym. I’m there everyday teaching a class or two and during that time my kids are in the daycare at the gym for that hour. So after class I read. I also go to a womens contemplative prayer group once a month (that helps a lot) and then daily when my kids have their quiet time I do my prayer/meditation/conteplation. Such inspiring & thought provoking words! I think I will need you to stop by when I start sharing my Testimony & struggles. You offer such great advice & encouragement! So wonderful to read these and refocus where we need to be. I was a morning reader, then took on a friends young boy with special needs. He arrives very early and I have fallen out of habit.I still pray as I drift to sleep and off and on through out my day, kind of like a friend on call waiting, but my special time needs to be put back on track. Glad to come across this today, great reminder! There is a great point in the prayer of the Book: Becoming the Woman God Wants Me to Be: A 90-Day Guide to Living the Proverbs 31 Life by Donna Partow. On Day 2, she, like you Laura tells us to Commit to Spending Time Alone with God. At the end of the days information it has a commitment prayer and one of the lines reads: “I believe, by faith, that one of the rewards you will give me is supernatural wisdom and the ability to conduct the affairs of my day with greater efficiency so that my Time Alone with God will in no way diminish my effectiveness but will in fact increase it”. & I can say on days that I do this that is very true. If you’re interested in a copy of the book you can get one here from amazon: http://astore.amazon.com/houss-20/detail/0800730720. Hello, I found this article while searching for information. I am 25, single, and am getting to a place where I am starting to learn what it looks like to be a man after God’s own heart. I guess what I’m wondering is what that really looks like, my role models in that arena seem thinner than I’d like. I know you’re women, but your viewpoint is still just as valid and important. What is it you think is the most important thing? And I don’t just mean that patented Jesus/prayer answer. I mean, what is the most important thing on the road to becoming this man I want to be? And what happens if I’m not blessed to be a husband? Thank you for your time. 3) Learn that you’ll never understand your wife, and you’ll never fix her. She just needs a hug. Really, the first two are some of the most attractive qualities in a guy. If you like kids you’ll be a good father. If you can work hard and save money, you can provide for a wife. Even if you never marry, the first two will benefit you in being a help in a ministry somewhere in the church.